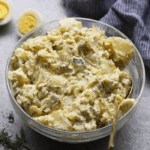 8 minutes in the Instant Pot and you’ve got yourself a delicious, healthy and homemade potato salad. This Instant Pot Potato Salad recipe is naturally gluten-free and lightened up with some Greek yogurt. 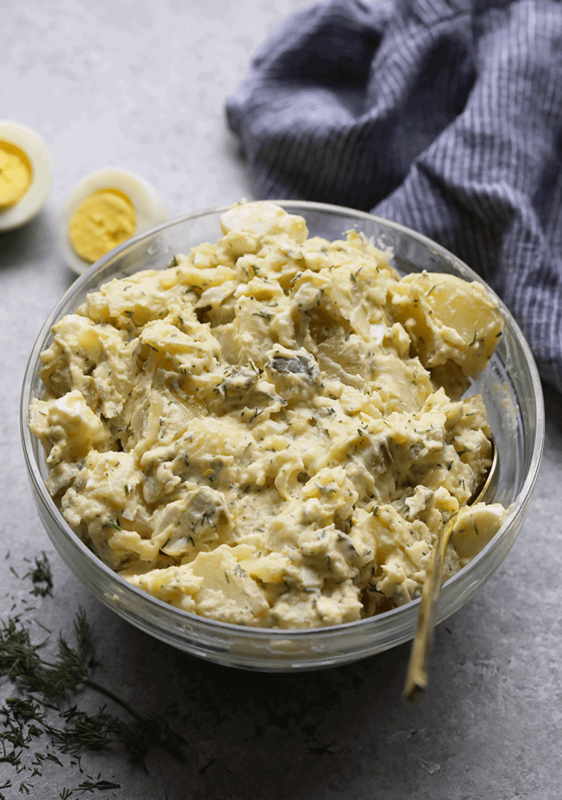 We love this delicious potato salad recipe because it is packed with all of the classic potato salad fixings, with a healthy twist. Is there anything that screams summer more than potato salad? I think not! It’s Linley here and I am freaking out about how amazing the weather has been in Minnesota this week. Because we have cold weather for 6 months out of the year, we REALLY take advantage of the sunshine when it’s nice outside. That means lots of time on the barbie (bbq:) No matter what you’re cooking on the grill, it wouldn’t be a BBQ without potato salad! 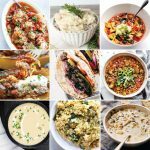 We have all been obsessed with healthy Instant Pot recipes this year. Guess what, you can make Instant Pot recipes all year long! 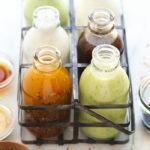 We have gotten so many requests for summer Instant Pot recipes –> because who wants to use their oven or stove when it’s hot out? NOT ME! 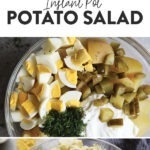 We have some of the best instant pot recipes coming your way this summer, starting with this healthy instant pot potato salad! It’s All About the Potatoes! People always wonder what kind of potatoes do you use in potato salad? We don’t like to discriminate against any potato! If you like red potato salad, we are in! If you like to stick with Yukon golds, we love those too. Potato, potato, people. We love any spud we can get our hands on! For this recipe, we wanted to stick with the classic flavors and ingredients of a midwestern potato salad- with a healthy twist. 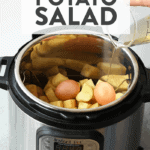 The beauty of this Instant Pot Potato Salad is that it only takes 8 minutes to cook your potatoes and the bonus is that you stick your eggs right in the instant pot with the potatoes! 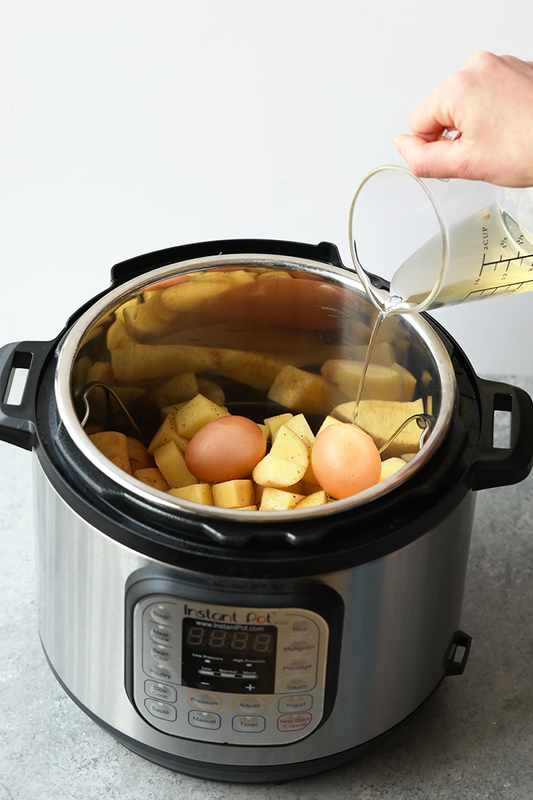 Two spuds, with one stone (hehe) While your Instant Pot is cooking your potatoes and eggs to perfections, all you have to do is add all of your other ingredients into a large bowl, mix well, and wait! It’s that easy! 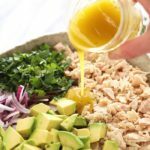 I love this recipe because you can make it for any summer bbq or you can prep it for the week as a healthy summer side. Place the metal rack inside of your Instant Pot (it comes with your Instant Pot). Place potatoes on top of the rack and carefully place two eggs on top of the potatoes. Next, mix your vinegar and water together into a bowl. Pour 3/4 cup of the liquid into the instant pot and set the rest to the side for later. 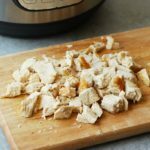 Cover your Instant Pot and lock it into place. Turn the pressure valve to ‘seal’ and press ‘manual’ and then turn the pressure to “high pressure”. Set the timer for 8 minutes and let the Instant Pot work. While your Instant Pot is heating up, place the rest of your ingredients (including the rest of your water/vinegar mixture) into a large mixing bowl. Mix well and place in the refrigerator. 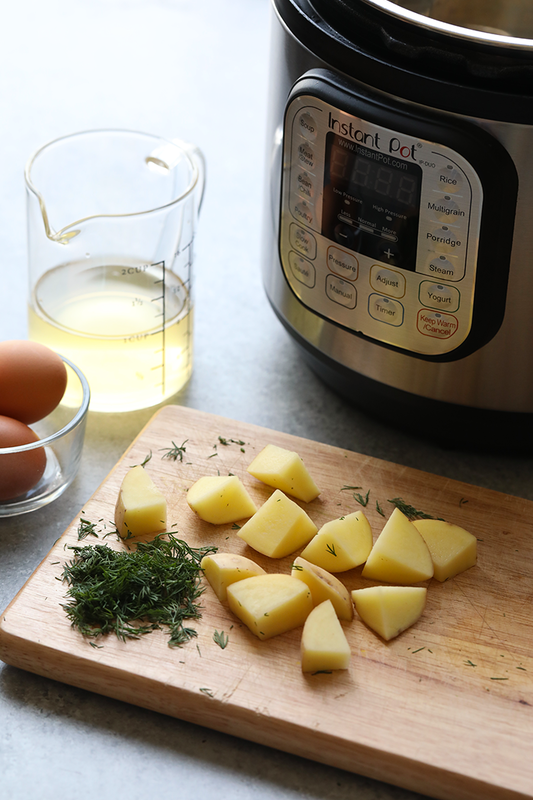 When the potatoes are done, quick release the pressure in the Instant Pot by turning the pressure gauge to ‘vent.’ Be careful that you are clear of the pressure gauge when steam releases. Place the hard-boiled eggs into an ice bath and transfer your cooked potatoes into a bowl and then place the bowl into the freezer/refrigerator to cool. Once the hard-boiled eggs have chilled for about 5 minutes, peel and rough chop them and place them in the Greek yogurt mixture. Mix well. Once potatoes are completely cool, add potatoes to the Greek yogurt mixture and mix until combined. Use a spatula to mash some of the potatoes to get that perfect potato salad consistency. Top with fresh dill and enjoy!